I got it in my head today that I was going to straighten my hair tonight. I looked at a few hairstyles first and then I had SO MUCH hope that it was going to straighten. I tried the back first. This is how it looked AFTER! Yes, I tried over and over and used my mini straightener. It CLEARLY did not work. I think the top must be longer because it did okay. 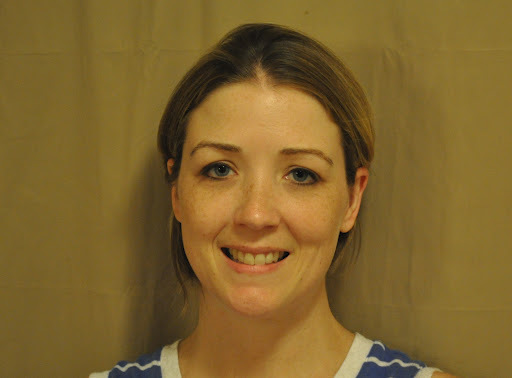 See pic below (I didn’t put makeup on…that probably would’ve improved the look some. lol!). Needless to say, I was so hopeful…my bubble burst when it didn’t work…and I burst into tears. My hormones are crazy right now. I blame hormones. I’m trying to be sooooo patient…but 1/2″ a month…..is WAY TOO SLOW! I received a comment on my last post that has really weighed heavily on me. Kevan asked me to delete the comment so if you go back to read it, it’s not there. Basically, the anonymous person feels like I am a very shallow person. The truth is….I struggle a lot with this blog because I feel like sometimes “it is all about me” and even though that is what the URL is, “Jayde’s Journey”…I want it to be about Him, my Lord and Savior. Not about me. I also wanted it to be a place for others who are struggling with cancer to find hope and a few laughs here and there. 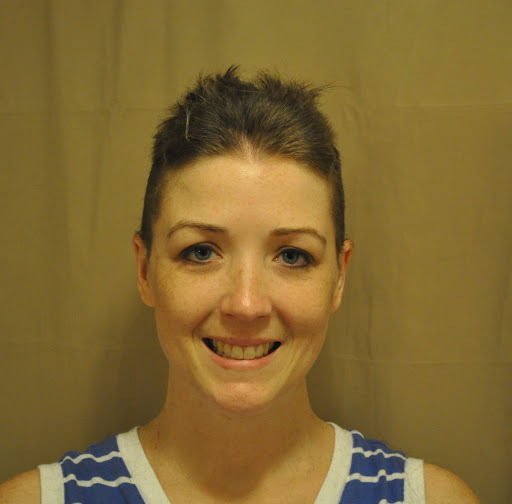 The purpose of this blog from the very beginning was to document my journey through cancer and being sad about my current hair situation is what I am going through currently. 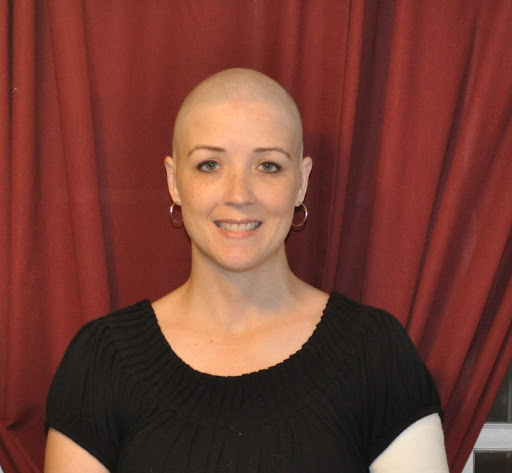 I can’t imagine that I am the only woman that has struggled with post chemo hair, but I also want to ask for forgiveness if it came across as shallow. I was actually trying to look on the bright side and that is why I posted the pictures of my past hair. I wanted to show that even though I’m struggling with liking the short post-chemo hair that it isn’t the worst it has ever been. But, I guess my post came across as shallow. I’m sorry. 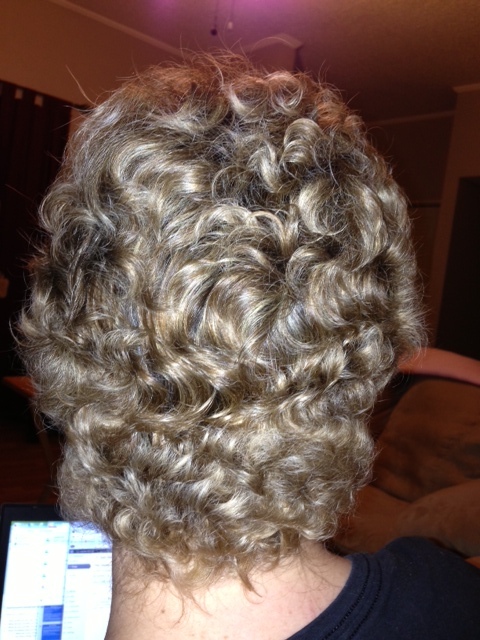 So, as I was sitting here feeling sorry for myself I started thinking about my hair before chemo. Here is one of the last pictures I took before I started losing my hair. I know I have not been updating my blog as often lately. I’m sorry. It is mostly due to not having the time. I have been sleeping better so I do not wake up so early anymore and I’m back at work so I just don’t have the time during the day. We have been pretty busy at night lately so I just keep pushing it to the next day and you all know how that goes. Kevan and I are really good at procrastination. Why do today what you can put off until tomorrow? I wanted to tell you a little about what is going on in our lives lately. God has provided a new opportunity for Kevan and I to fully depend on Him. Which we should do daily, but sometimes with the big things we want to rely on ourselves before we rely on Him. For this…I’m choosing to rely on Him sooner than later! Earlier this year it was my cancer and now it is Kevan’s job. Kevan found out that his yearly contract will not be renewed (due to a lack of work this time of year) and his last day at work is this Wednesday. He has spoken to several headhunters and has discussed several promising positions, but most of them are for 100% travel. He has worked from home for the last 2 years and I have worked from home for the last 9 years. It would be a huge adjustment to have him gone every day. I know we’ve been spoiled, but God also knows how much this works for us. So, I’m praying that God will provide Kevan a job that has 40% travel or less. I think he would enjoy some travel, but it would be so hard on us if he was gone every week. There are several reasons why we don’t love the idea of him traveling every week. I will bore you with them…sorry…but I want to remember what was going on in my head during this time. 1). We live in a very rural area and the airport is about 1.5 hours from us. 2). We only have one car…so we would have to get another one. 3). He’s my best friend and I just don’t want him gone all the time. I do love my alone time as I am an introvert and love to be alone to read…but I love being with him and it will feel strange to not have him here with me. 4). My surgery in December. If he takes a travel job around my surgery time then I will need someone to help me at home. Also, we have a wood stove…I won’t be able to lift over 5 pounds for awhile…the house is going to get pretty cold if there is no fire in that stove. 5). Church – Kevan and I are very involved in our church. If he travels throughout the week he can no longer teach on Wednesday nights or be involved in other weekly church activities. This is huge for us since we love our church family so much. Anyway….I am praying specifically because I know my Heavenly Father loves us and I know He can answer specific prayers. Please Lord….please provide my sweet husband a job that is only 40% or less travel. Please have it be a job he loves and enjoys waking up to each day (like I do my job). Thank you for blessing us so much in our life together. You are our Provider. I ask these things in Jesus’ Name, knowing in my heart that you are able to provide them….Amen. I was writing a friend the other day about someone she knew that was just diagnosed with breast cancer. I wanted to give any help I could to make this journey easier for her, but the #1 thing I realized while writing that email to her was that the #1 thing that WILL get her through it and through any situation is prayer. Seriously, without prayer I would not have made it or the journey would’ve been so much worse. My prayers, your prayers and the prayers of Jesus, to the Father, on my behalf….all contributed to my journey. Yes, Jesus intercedes for us while He is at the right hand of the Father (Romans 8:34, Hebrews 7:25). I find so much comfort in that. So, as I prayed for my cancer, I will pray for my husband. I give this worry to my Father who I know can give us the desires of our hearts if we only delight in Him (Psalm 37:4). Now, I will tell you a funny story. I haven’t been wearing my wigs as much because the hair in the front that touches the wig band has not been coming in like the rest of my head. I think, because it rubs and brushes the hair off. Well, last night Kevan and I had to drive to Outback Steakhouse to retrieve my credit card that I left there 2 weeks ago. Oops! Anyway, while we were sitting in the bar (because the place was packed and I didn’t want to wait for a better table) I noticed that people would look at my head covering and then smile at me with this sympathetic smile. Which, of course, is very sweet of them to realize I must be bald under that covering, figure I have cancer (which I don’t anymore PRAISE GOD!) and then feel bad for me. Men even jump to open the door for me or offer me a seat if we are waiting for a table….which didn’t happen much before cancer. Kevan and I were walking to the car after dinner and I said, “I wonder if that is how they would look at me if I walked around with my bald head instead of my head covering.” We were on our way to a movie…so, Kevan suggested that when we go into the theater I should walk in with my bald head instead of the head covering and see how people react. So, I did. LOL! (Keep in mind that it was FREEZING last night….my poor head was so cold!) It was so funny to see the different reactions. Of course, people did a double-take. Kevan watched a pretty blonde girl look up at me and then when I passed her she continued to stare at me while I couldn’t see her. LOL! What I really noticed though was the smile so many gave me. It wasn’t a sympathetic smile at all….it was a happy smile….which then….made me smile. Now, they could’ve been laughing at me on the inside…I don’t know…but at least it wasn’t sympathetic. Also, I was impressed with the girl at the popcorn counter because she called me “Miss”….I was so happy that she knew I was a woman! lol! 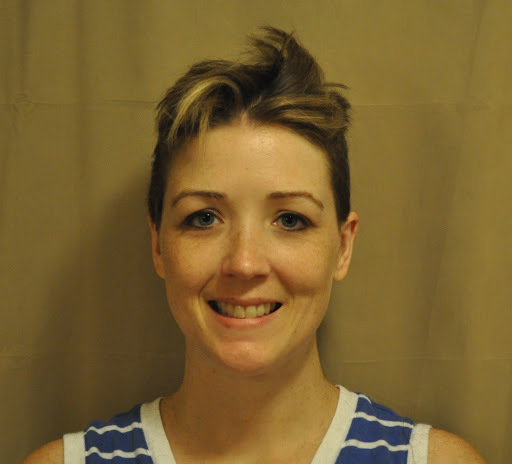 Without hair I feel like I look like a man. After the movie Kevan and I were talking about it and he believes that the happy vs. sympathetic smiles were because with the head covering on I look like I’m still going through cancer treatment, but because I have a little bit of hair now (VERY LITTLE) they can see that my hair is growing back so they are happy for me. I don’t know if that is it, but I liked the happy smiles a lot more than the sympathetic sad ones. If it wasn’t so cold out I might consider going around bald now. lol! It is definitely more fun! Before I show you some pictures I wanted to mention that my eyelashes are continuing to fall out and my eyebrows seem a lot thinner (you can tell in the two pictures below too). I’ve noticed the eyelashes since I hardly have any on the bottom now when I go to do my mascara. Maybe 10 total. :o( Hopefully, this will stop and they will start to grow back soon. I’ve been wanting to update the blog with a hair growth picture, but I can never get Kevan to stop long enough to take a picture. 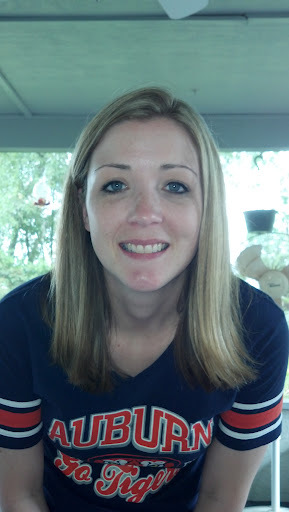 Here is a picture that he took of me on October 12th. 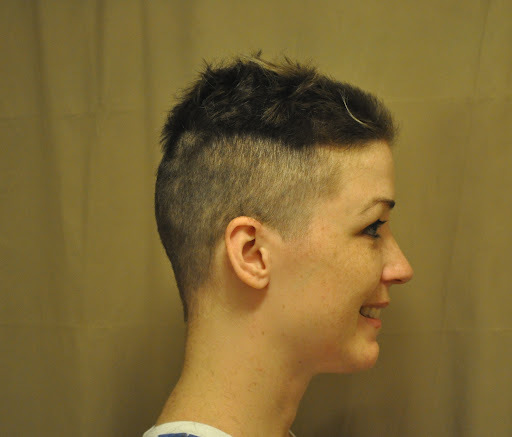 Here is my side view right now (yes…I apparently have a mole on my head. lol! I didn’t know that before my baldness). 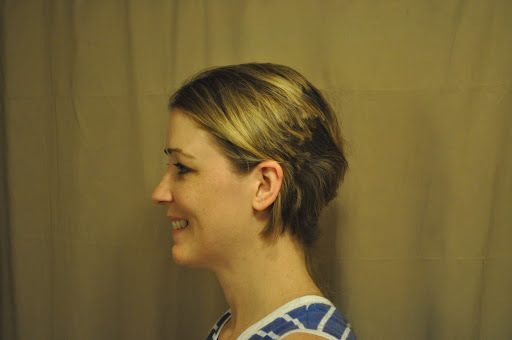 I HATE pictures of myself so I really hate posting these bad pics….but so many have been asking me to update the blog on my hair progress…so here you go. First, let me give you the great news! I have peach fuzz on my head! 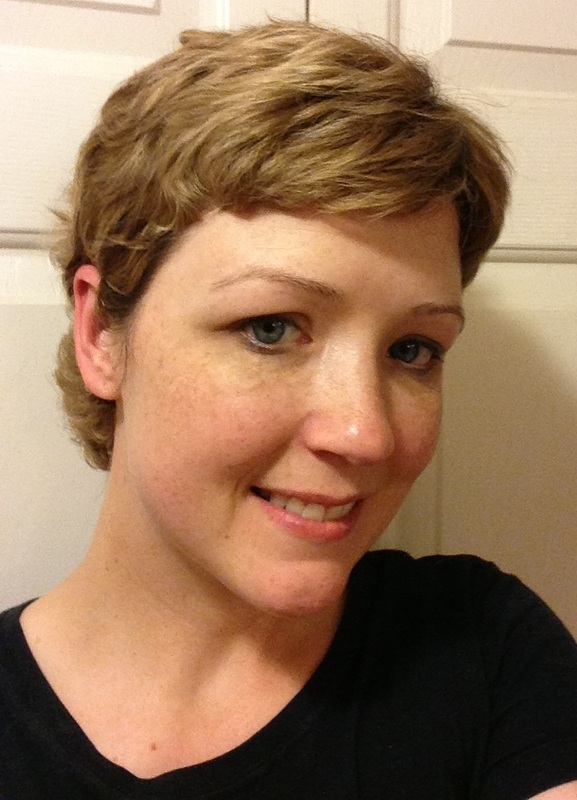 Yes…my hair is starting to show…just a little! I am actually very excited and have shown quite a few people. Most of them think I’m crazy because you can hardly see it, but I see it! The only downside to hair growth is that it is also growing on my legs and underarms so I have had to start shaving again. I guess the no-shave vacation is over. lol! I was going to post a close up picture of the hair on my head…but when I add the picture I cannot find a way for it not to look ridiculous…so let me play around with how I’m going to do it. Then, I’ll post a picture. 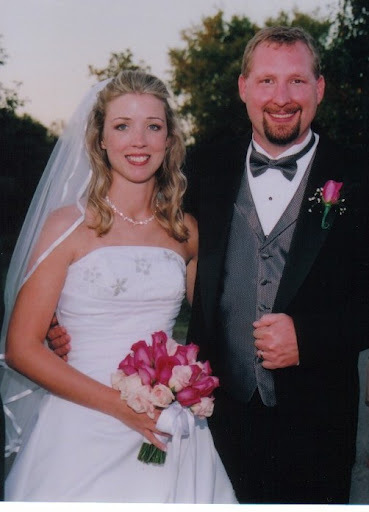 Yesterday, was our 9th Wedding Anniversary. I’m so glad that God brought us together. I love my husband and know that he is the man God planned for me. I am blessed that God healed me of breast cancer and I can spend many more years with my best friend. Our wedding day was such a special day. I can’t believe how young we look. Here is a picture from our wedding. I am currently down 7.5 pounds since I started my diet on 9/10. I know I am losing slowly, but I didn’t want to put my body through too much right now. I also started doing the treadmill 4-5 times a week. My diet is going well. I haven’t eaten at a fast food restaurant in 4 weeks except places like Qdoba, Chipotle Mexican Grill, etc…where I can get fresh food and not processed or fried foods. I have not had any sugar or any type of dessert either. I have had my Ezekiel bread apple muffins (made with freshly ground flour, my FIL’s eggs & apples and local honey)….which taste healthy and not dessert like. I use use honey to sweeten my iced tea, breads or muffins. I am pretty happy with how it is going and I feel good about eating healthier. I did cheat once and had sushi (which has white rice), but it was so good I was okay with it. lol! The wind is a little cold so I decided to go lay in the sun to get warm. I laid my beach towel down on the sand….got it just right and then laid down. As soon as my body hit the sand I realized “OUCH”…this isn’t gonna work! My very hard tissue expanders came into contact with the very hard sand. I thought about lifting up my towel to dig a little ditch to fit my breasts into (LOL! ), but I realized if anyone was watching me I would be very embarrassed. LOL! So, I tried to lay on my back, but it was no fun. I went back to my chair. I’m wearing a cute little fishing hat but it keeps getting so hot I take it off. I am a little self-conscious here. Not sure why. It might be because so many women at the beach look cute in their suits and pretty hair and my husband has to look at his poor wife with her bald head and extra weight. But, I am blessed that I can be out here in a two-piece bathing suit 5 months after a double mastectomy. It is pretty amazing. I went in the water for a bit with Kevan. On our way back to our umbrella I noticed two pretty iridescent crows sitting on each of our chairs. Well, one pooped on my shorts. Lol! They aren’t as pretty anymore. This isn’t the first time I’ve been pooped on at the beach. A seagull pooped on my arm last year. I hear it is a sign of good luck, but I’m not sure. :o) I think it means I need to spend more time at the mountains. Here is a picture of me from the beach. Soon I will write a post about the many things we did in Florida. I’m stretched for time lately and haven’t had a chance to get the pics off my camera yet. I know I’m not writing as much lately. I am doing so much better that there is not much to write about and I haven’t had much time now that I’m back to work. Plus, Kevan and I are in Florida this week. So, I haven’t had much time to write since we are running around after work visiting friends, eating at good restaurants and enjoying Florida. I did want to post something funny though. Like I said, we are in Florida. It is VERY hot here compared to Tennessee. My head is getting so hot having to wear a wig every time we go out. I was complaining in the car today as we were coming back from our dentist appointments. I told Kevan I couldn’t stand it anymore and I was just going to drive around bald. I handed him my wig and told him to put it on and see how it feels. I wanted him to feel what I feel….hot and sweaty! I’m doing great today and have been for several days. It is amazing how well the body bounces back. 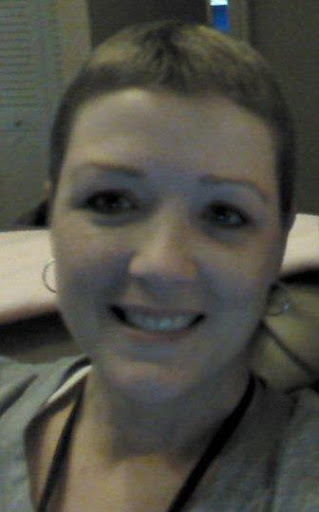 Tomorrow I will be having my 3rd chemo treatment of taxotere and cytoxan. I am dreading it as usual. Since I’ve been bald for several weeks I decided to do a top 10 list of the reasons why I like my bald head. This may help some of you that have to lose your hair to like it a little more. I have to say that I haven’t really missed my hair. I’m strange though. :o) I think I just know it will grow back and this is just a part of the process. Although, Kevan does miss my hair and I’m sure he cannot wait for it to come back. I am also a little scared of how it might change when it grows back, but I am praying that God blesses me with straight hair since I had wavy/curly hair before and had to straighten it each day. 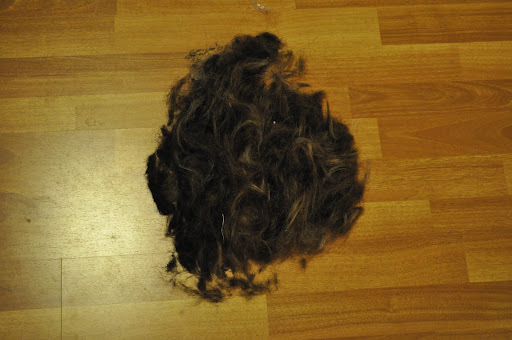 Many have asked me if I have lost all of my hair (head hair, eyebrows, body hair, etc). So, I wanted to give a little update before the top 10. Before my chemo I was under the impression that it would all fall out at once. That isn’t the case. 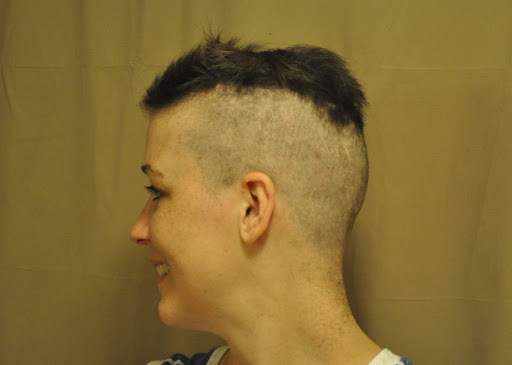 As far as my head hair…it is pretty much all gone except for the annoying patches of hair behind my ears. See ugly pic below. lol! Kevan wants to shave it, but I don’t like the feeling of a razor on my head. I have not lost my arm hair that I can tell, but have lost about 70% of my leg hair…but the remaining 30% is not growing because I haven’t needed to shave in weeks…usually I shave every couple days. I’ve also lost about 80% of my “other” body hair. It would be a great time for me to go to the beach if I was allowed to be in the sun. ;o) I am losing eyebrows and eyelashes VERY slowly. I have most of them still. I am SO thankful for this. This was my biggest worry when I found out I would lose my hair. I am hoping I get through the last 2 treatments with my eyebrows and eye lashes. The obvious, you will save money on shampoo, conditioner and other hair products. You will also save money on coloring, highlighting, haircuts, etc. You save a lot of time not having to do your hair. It used to take me about 20 minutes to do my hair because I had to blow dry it and then straight iron it. Now, it takes me about 2 minutes to put my wig or head covering on. Your bathroom counter is a lot less messy. I don’t need a brush, hair dryer or curling iron. So, they’ve been put away for now. 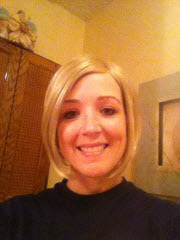 You have the opportunity to go to a wig store and try on all different kinds of wigs and hair colors. I learned that red hair with black stripes does not look good on me. But, it was fun to try it on. I can see myself with bangs or without, black hair or blonde hair, short or long, pink or blue…..whatever you desire pretty much. Take pictures so you can remember. I should’ve taken pictures, but I always feel like the shop owner is too serious. lol! You can decorate your head. Just think of the Halloween possibilities! I will definitely be doing this if I don’t have hair at Halloween. It is the only time you will let someone tape your head. Yes, my husband decided he was tired of looking at the hairs that had not yet fallen out. He calls it my 5 o’clock shadow. He thought tape would work. So, he grabbed the pet hair tape roller and used it on my head. Here is what the taped look like after a good roll. Warning – it kinda hurts, but it is pretty funny. It may be the only time in your life that you can check the hair color of “bald” on a form. I think that is pretty funny too. 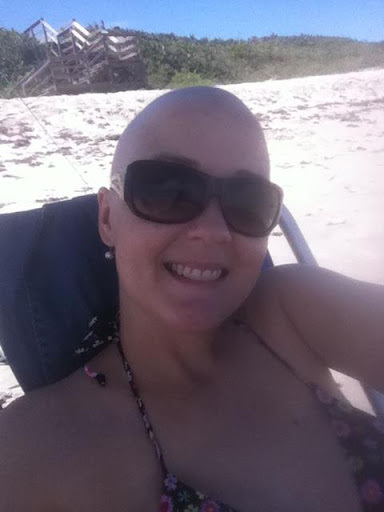 When you are having a hot flash (which you will get from chemo if you haven’t reached menopause yet) you can remove your wig or head covering to cool off extra fast. I recommend only doing this at home. ;o) People are just too uncomfortable with a woman’s baldness. The ultimate reason to like your bald head. The shock on someone’s face when you take off your wig or head covering and reveal your bald head. I think it is hilarious and it never gets old. lol! When I woke up today my hair was falling out in HUGE clumps. I don’t know why, but I thought it would fall out little by little. Um….no. It falls out in handfuls. 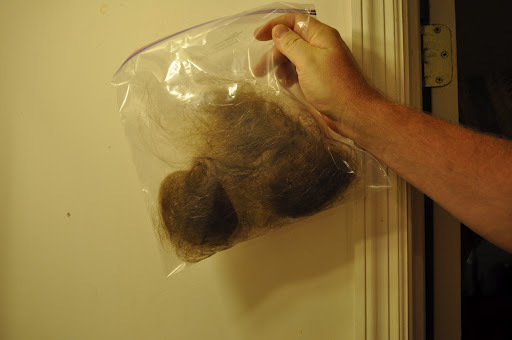 Here is a picture of a ziploc bag of how much hair just “fell out” during the day today. It is a GALLON size ziploc bag. So, we decided. Today was the day. I didn’t want to go through this again tomorrow. Kevan and I decided to have fun with this. Kevan’s dad came over with his clippers and we got to work. I didn’t want it to be a sad time. I knew it was going to happen, I accepted it and I prayed for God to give me the strength I needed to get through it. He answered my prayer because we didn’t shed a single tear (Kevan or I). We laughed all the way through it. Here is a before picture. 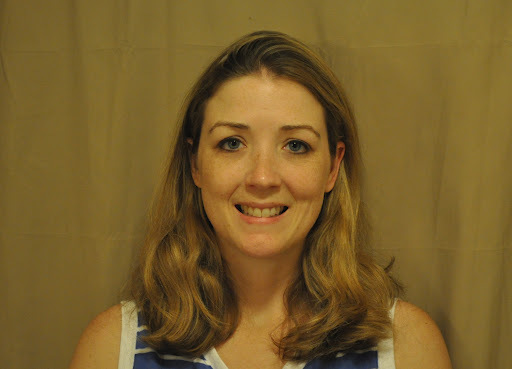 I normally straighten my hair every day….so this is a really BAD picture of me because I had to let it just dry. Also, I didn’t put any makeup on. I guess I should’ve, but I didn’t feel like taking the time. Plus, the shower curtain ism’t doing much for me. If I had taken the time to straighten it…there would not have been any hair left. 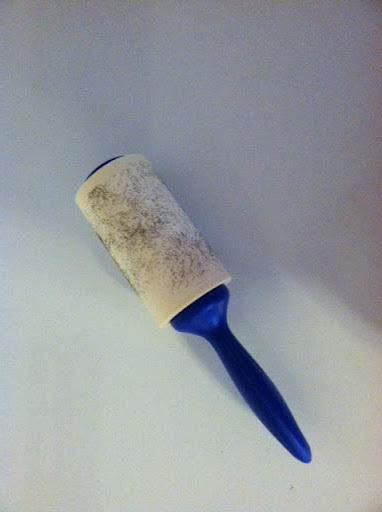 To give you an idea…..here is a picture of my clean brush. This is a picture of ONE brush through. Just ONE. CRAZY! It is pretty gross! First thing we did was cut off my ponytails. This is what we ended up with. Short haired Jayde. As you can see…my part is already starting to look bald. Then, he shaved the sides. Lovely. Can you tell I’m a girl? 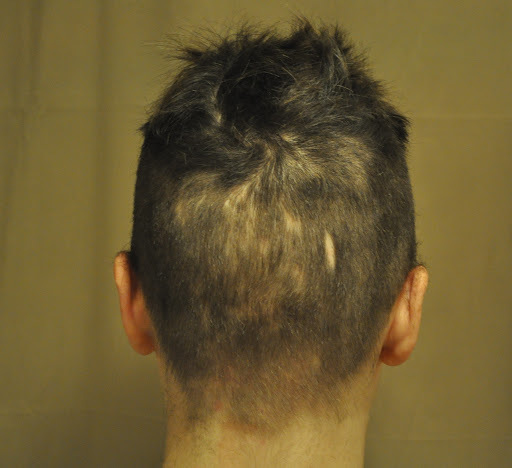 David….here is the scar in the back of my head that you gave me from the back of the hammer you threw at me….I mean dropped on me…by accident. I know. I know. You knew it would come up….didn’t you? lol!! Wow…I sure didn’t recognize myself in that last picture. As you can see from below….Kevan wasn’t that great with making a mohawk. He had to work a little harder. He said it was my fine hair….I don’t know. Side view after we cut off more of the sides. The mohawk thing just wasn’t working for me. My part balded earlier today…so it just didn’t look right. So….what did I learn? I have a REALLY ugly bald head. LOL! Lots of scars, bumps, moles. Eww! Here is a picture of the floor when we were done. I wonder how many of you scrolled to the bottom first to see the “after” picture. Well, here you go. Here is Jayde will her ugly bald head! LOL!! I had to change the background and my shirt. I just couldn’t reveal the after picture looking all pale. I told Kevan how happy I was that I had straight teeth (I just got my braces off in April) and he said, “Ya, because everyone’s going to be looking at your teeth.” LOL! Thanks Babe…what exactly are they going to be looking at? 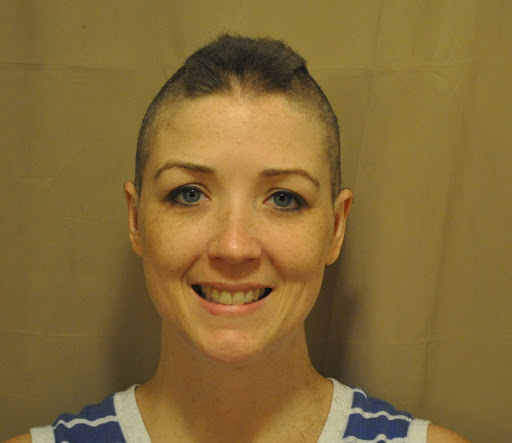 Also, my father-in-law said….”if you take one earring out you’d look just like Mr. Clean.” Um….thanks. LOL!